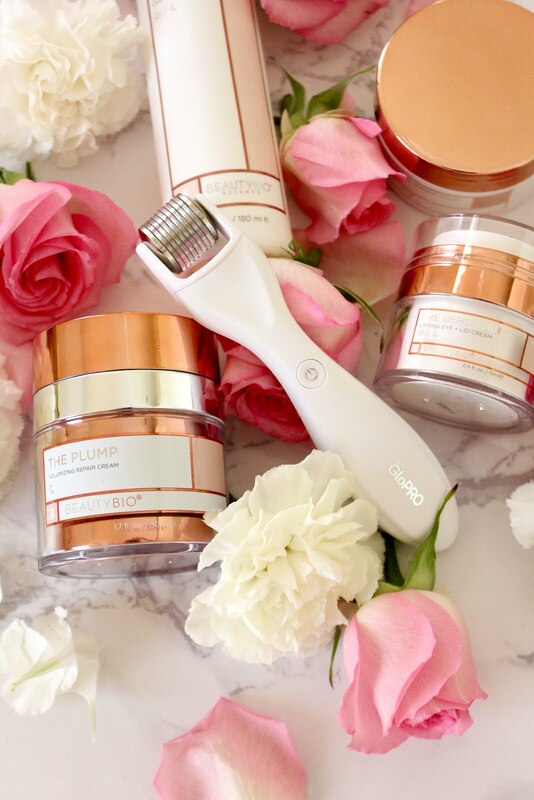 Today I am so excited to be teaming up with Beauty Bioscience to share with you my nightly routine featuring the GloPRO Miro Needling Tool. I am entering a new decade of life this year (insert crying emoji) and I am now realizing the importance of taking care of my skin. As a mother, I tend to put things like this on the back burner. I am lucky if I get a shower to myself, let alone go get all the fancy treatments for my skin. Let me tell give you a little info on the GloPRO Micro Needling Tool. It is a tool that stimulates the skin. 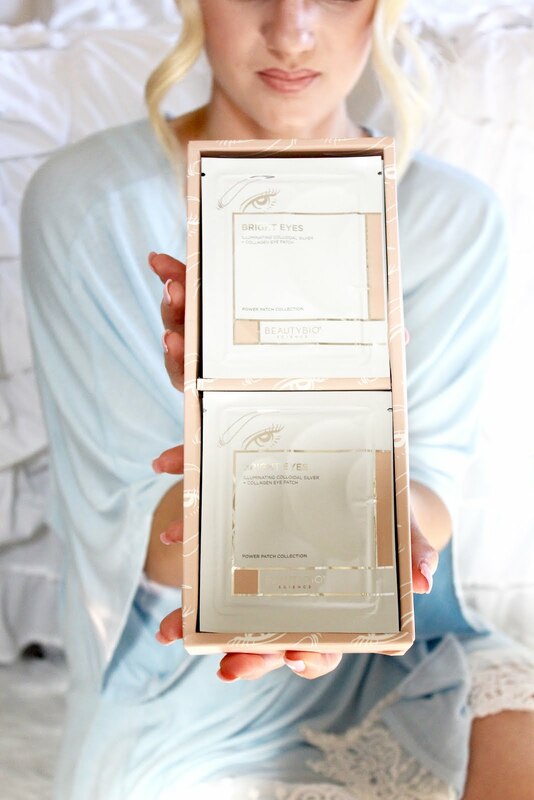 As the micro tips pass over the skin, the rejuvenation process begins immediately as the cells respond by restoring volume from the inside out. 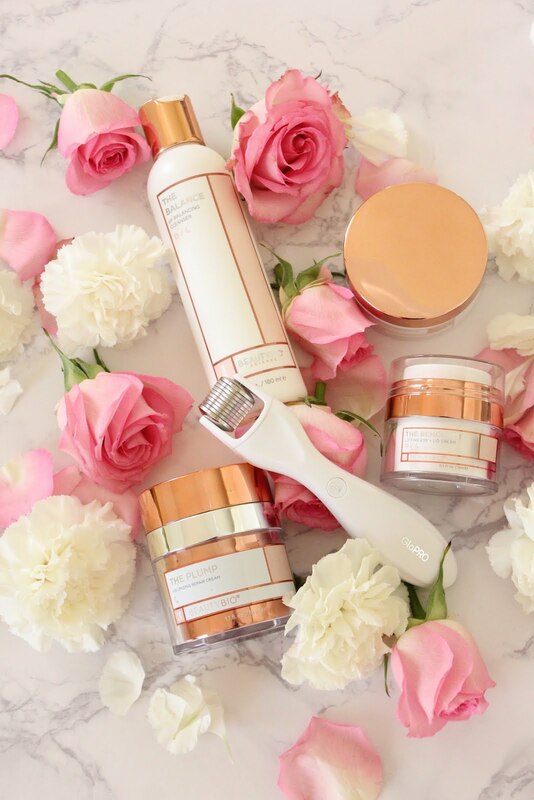 The results are smoother, firmer skin, and reduction of wrinkles. And the best part...drumroll, it only takes ONE minute, 2-3 times a week! This I have time for. First, I wash my face with the PH Balancing Cleanser. Then, I follow with the Cleansing Prep Pads; which prepares the skin for the mirconeedling. Use the GloPRO for 1 mintue (avoiding eye area). I then use the Beholder Lifting Eye & Lid Cream under my eyes and on my lids. Oh boy, have I seen a major difference in just 7 days of using this stuff! Finally, I use The Plump Volumizing Repair Cream. I love this stuff not only because it helps signs of aging, but when I wake up in the morning I feel like I just applied it. My face feels moisturized and PLUMP! It's hard to pick a favorite from all these products, but I think I do love the Bright Eyes Illuminating Eye Patches. I would say that over the last three months my under eye area has become saggy and dark. This is a collagen infused eye patch with illuminating pearl to help eyes appear brighter and more rested. Gold in a bottle! Beauty Bioscience has so many more products available to you depending on what your skin is in need of. You can even buy different attachements for the GloPRO to target different areas of your body. The next product I want to try is The Brighter Two-Part Cell Renewal Treatment! If you have any questions, feel free to ask away! Thanks for reading! Hope you have an amazing weekend.